Amir describes Baba and relates some memories of him. There was a legend that Baba had once wrestled a black bear with his bare hands. If it was anyone else Amir would have called it a fable, but with Baba it was probably true. Amir describes him as a “force of nature,” a huge man with a wild beard and hair. It is significant that Amir opens his description of Baba with this legend – both showing that Baba is a larger-than-life figure, and that he has spent his life wrestling with things, as the bear will symbolize other struggles later. Baba always succeeded where other people said he would fail. He had no training as an architect, but he had designed and built an orphanage and paid for it himself. Amir describes how proud he was when the orphanage opened, and how he was jealous when Baba would sometimes praise Hassan over Amir. Baba has overcome many challenges and become successful – he is a man of force and action, and it is clear how much Amir admires him. Amir’s jealousy surrounding Baba’s affections is first revealed here. More of Baba’s successes included business – people thought he would fail, but he became one of the most successful men in Kabul. They also thought he could not marry well, but he had married Amir’s mother, Sofia Akrami, who was beautiful, well-educated, and of royal blood. Amir describes himself as the “glaring exception” to Baba’s successes – something Baba could not control to his liking. Baba saw the world in black and white, and Amir could not help loving him without fearing him, and possibly hating him a little too. Amir reveals himself as a disappointing son to Baba, though he doesn’t explain why yet. Baba sees things clearly as challenges to be overcome, and yet he has been unable to be as “successful” at fatherhood as he was in business or marriage. Amir hints at the complexity of their relationship here. This father-son connection will be one of the most important elements in the book. One day at school Mullah Fatiulla Khan, a religious teacher at Amir’s school, taught the children that drinking alcohol was a sin punishable by damnation. Amir tells Baba this as Baba pours himself a glass of whiskey. Baba calls the religious teachers “bearded idiots” and says “God help us all if Afghanistan ever falls into their hands.” Baba explains that the only real sin is theft – to lie is to rob someone of the truth, and to kill is to rob someone of their life. Baba has a strong moral sense, but it is independent of the stricter Muslim rules. Hosseini introduces another social divide here, between the conservative, fundamentalist Muslims (like Amir’s teacher) and more liberal Afghans like Baba. Baba’s words foreshadow the brutal Taliban regime that is to come – when these same fundamentalists take over Afghanistan and institute a violent religious law. Baba’s speech about theft will resonate throughout the novel, and deals with the theme of betrayal. Amir constantly tries to please Baba, but usually feels like a failure. He can’t help but think that Baba hates him a little for “killing” his mother in childbirth. The only skill Amir feels he has is reading and memorizing poems, and Baba looks down on such pursuits. Amir tries to please Baba by playing soccer, Baba’s favorite sport, but Amir is a terrible player. Once Amir goes with Baba to a Buzkashi (the national Afghan sport, similar to polo) tournament, but he cries when a rider gets trampled and Baba cannot hide his scorn for Amir’s tears. Amir feels he has betrayed Baba by “killing” his mother, and is constantly trying to redeem himself by becoming a better son, though it is clear that their natures are very different. The things Amir admires most in his father – his strong principles, forceful success in all his ventures, and love of sport – are the things Amir most lacks. Amir’s desire to please Baba will lead to conflict later. Rahim Khan, Baba’s friend and business colleague, seems to understand Amir better than Baba. Amir overhears him encouraging Baba to respect Amir’s love of books, and to accept that he cannot make Amir exactly like himself. Baba says that Amir seems unable to stand up for himself, and he worries that he won’t be able to stand up for anything when he becomes an adult. Baba says that sometimes he can’t believe that Amir is his son. Rahim Khan acts as a more understanding father-figure to Amir here and later in the novel, one who is willing to nurture Amir’s love of reading and lack of forcefulness. Baba’s worries undercut Amir’s own search for courage and approval, and will resonate later in Amir’s life. Cosby, Matt. 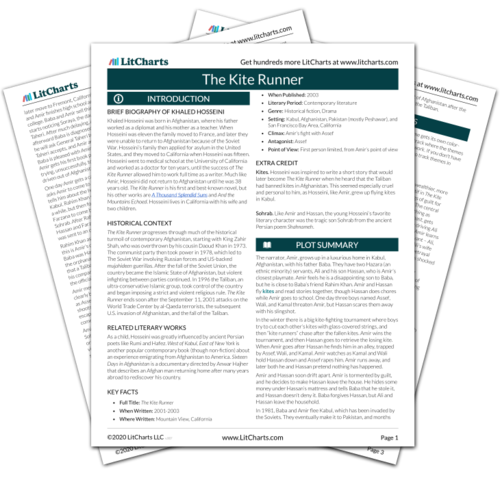 "The Kite Runner Chapter 3." LitCharts. LitCharts LLC, 9 Feb 2014. Web. 24 Apr 2019. Cosby, Matt. "The Kite Runner Chapter 3." LitCharts LLC, February 9, 2014. 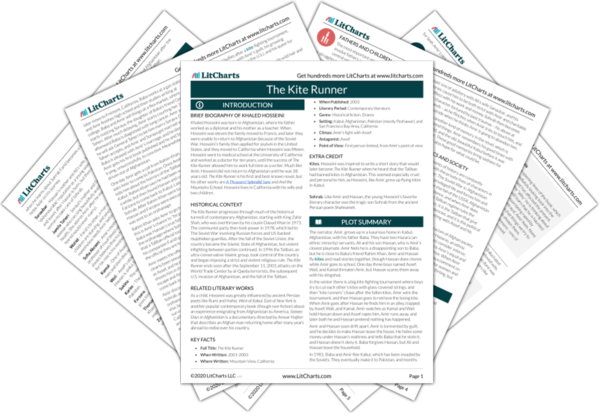 Retrieved April 24, 2019. https://www.litcharts.com/lit/the-kite-runner/chapter-3.